Have the player mage describe the spell they want to make in a single sentence. Each box of the crossword is a book they need to find or buy that loosely corresponds to the subject of that word. Boxes at the intersections of the words are harder to find and are about both topics. So, 1 across means I will need to find 5 books about the seeking aspect of the spell, maybe there are books on Migratory Birds, or Lodestones, books on a Tribe of Night Hunters, etc. I can go to booksellers in a city and purchase these for 100 to 600gp, but if I can't find them, I might need to keep a look out for them in dungeon libraries. Another thought is that these don't have to books, they could be scrolls, other spells that are about that topic, or even NPCs you can interview. The intersections of the words on the crossword, like the first square of 2 Down, are something more difficult to find. In this example Enemy crosses Seeking. So, maybe the book here would deal with even determining that someone is a threat-- Divination of Hidden Enemies-- or maybe it would be Esoteric Auras of those Using Magic. I would say if we can buy one of these rarer books it should be more expensive 1000-6000gp, but more likely it would be worthy of a mini-quest. More words or more complicated words make for a bigger library requirement and more expense. I think part of the fun of it would be the player putting the spell they want into as few words as possible. And I don't think the DM needs to be the devil in negotiating here, trying to trip them up. The point is to produce fun. Some other thoughts. The books the player acquires could be used to research other spells later. This would make it feel like they actually had a research library, if they could say something like "I have a good selection on magical Seeking." One potential problem is that players don't know what spells they might make, especially newer players. For my game I thought about making a new spell a requirement for joining the City Mage Guild, to kind of force the issue. If the player has a hard time coming up with a specific spell idea, I can have the Guildmaster suggest something they need. A bigger problem could be that the potentially powerful effects that are traditionally kept from players by higher spell level would be easily available here. I mean like damage causing spells that always hit or spells that incapacitate enemies. With this simple word system there is nothing to keep a player from making a super powerful spell. I guess that might be the DMs role, to negotiate this, and say for example "Traditionally in this world, it has been very difficult to put more than a few weak minded fools asleep at once," etc. But, anyway, I think it might be fun, let me know any ideas you have. 1. Great to have you back. 2. Thanks for sharing that crossword tool. 3. This is fun, great idea! 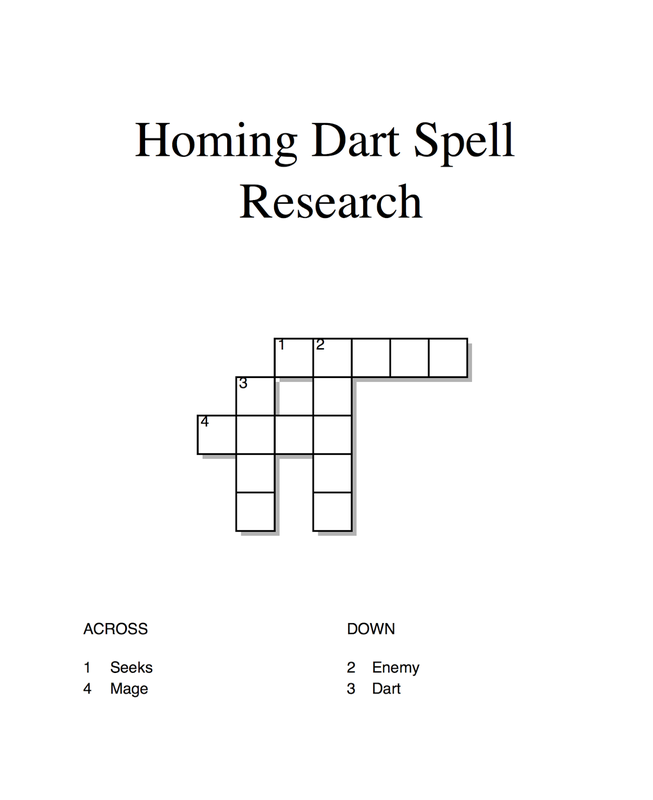 To handle the ability for the player to abuse this, the DM could set a level of the spell in advance, and every level is +1 word, so for Telecanter's Homing Dart, you could say that it is level 3, so two base words +3 for a total of five. A Marlowe's Marvelous Mass Sleep is decreed to be level 10, so two +10 is 12 words... pretty hard to find all the books needed to make that happen. And I like that their library can be reused, both as a way to increase their power, and as a way to root a player in an area... no way they are traveling about with 1000 books unless they spend time/money to get a magical means to do so. So library might mean building a wizard's tower. Membership to guilds to get access to their libraries will mean more too. What if the specific letter at an intersection determined in what way that knowledge is rarer / more expensive / etc.? e.g. a "D" at an intersection means the book is only available in a foreign land or language, while an "L" at an intersection means the book has been banned by the authorities and owning a copy is heretical? You'd just need to come up with a list of 26 of these modifiers. Maybe make their difficulty inversely related to each letter's Scrabble tile frequency, so an "E" intersection is extremely expensive, while a "Z" intersection is a rare book that falls into their hands through some incredible stroke of luck, or it's a magic book with extra benefits outside of the spellcrafting, or I don't know, I just want players trying to come up with spell descriptions that have multiple Q's and X's in them. Somewhere on the 'net are a series of random _____ generators, and book titles is one of the many. 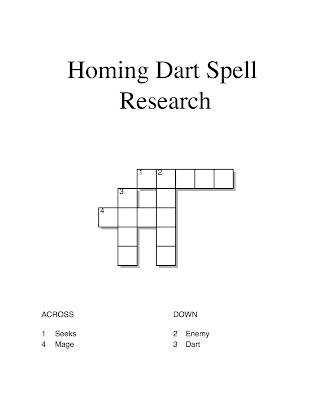 I even found a random book title generator that also lists the contents - including spells, and dovetails nicely into your crossword spell research. Each clue could be a level: 'dart seeks enemy mage' is 4th level but 'sleep' is only 1st (because the point of a 'sleep' spell is 'sleep'). 'Mass Sleep' must be at least 2nd but maybe 3rd - 'make many sleep' is a more accurate description, researching 'mass sleep' might produce a spell to make heavy things inert.